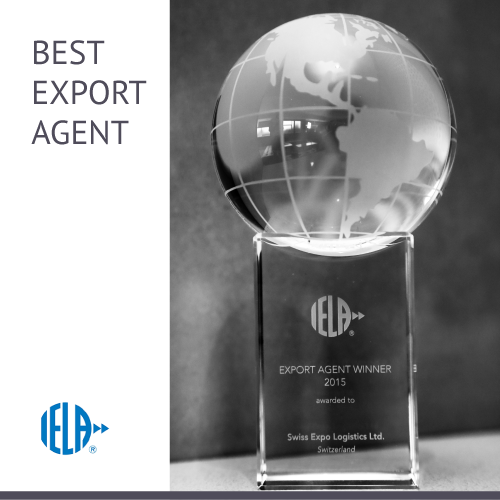 SWISS EXPO LOGISTICS has yet again been honoured with the prestigious „Best Export Agent“ award by the IELA. We are proud of everything we have achieved and grateful to the IELA and our customers! By land. By sea. In the air. We take care of what WE know best, so you have a clear head to do what YOU know best. We are your partners, experienced on national and international trade show market. Intermodal or land transportation is always a part of our offers. Whether pick-up, main run or last mile, we not only show the way but accompany your goods to its final destination. Especially heavy cargo and oversized bulky freight over long distances are more efficiently transported by sea. We will transport you safely by water to your destination. Above the clouds liberty should not only be unlimited but also transportation must be safe and reliable. We will bring your goods safely to their destination and back. We take care of what WE know best, so you have a clear head to do what YOU know best. Years of national and international experience of working hand in hand with renowned partners in the area of trade fairs enables us to prepare your stage for an outstanding performance. Punctuality, reliability, transparency and flexibility meet the conception of that we have of ourselves. Your individual requirements come first – Get your tailor-made offer now. Our service concept is based on two foundation pillars: „Transportation without borders“ and „Quality through reliability“. „Quality through reliability“– so all good things can last a long time. We are aware of the fact that the development of your products and concepts require massive effort. This is why we already add an awareness of safety and accuracy on our way to the destination to make sure that good things last a long time. We offer you an extensive and internationally valid customs clearance service. Part of it is the registration and preparation of the necessary documents and goods such as the import and export declarations for customs clearance. We also keep an eye on all adminstrative regulations for you and thus help you avoid any delays in the logistical chain. Our qualified customs service makes sure that anything that is dear and valuable to you will get to its destination safely and on time. You cannot predict everything. But you can be prepared for everything. We don’t exclusively care about the inner values. We take care of diligent packaging of your exhibits and empty container handling, during and after the show. We take special care of safety and sustainability. Neben unserem festen Team an Branchenkennern für den Logistikbereich beschäftigen wir je nach Bedarf einen zuverlässigen Kern an Mitarbeitern, die sich um Aufgaben rund um unsere zusätzlichen Serviceangebote, wie z. B. die Standbetreuung bei unserem Messeservice, kümmern. We organise and implement everything that a perfect trade fair appearance needs. With our sense for all necessary requirements of a modern and successful trade fair appearance we think through all details – an elegant, smooth running process and your on-site carefree company representatives who can focus on their expertise knowing that an experienced and commited logistics contact is always there to rely on. A technically and harmoniously perfect situation that is compatible with the overall concept of your company profile is the guideline to our professional work on site. Just tell us what you need, we will make you a proposal on short notice. Your success is our goal. We develop your transportation concept during the preparation phase of your trade fair appearance, guarantee the on time delivery of your exhibits at the stand as well as coordinate the on-site logistical process. Before the trade show is after the trade show – if requested we arrange the return transport to your factory, the delivery to another trade fair or the shipping to a customer. Swiss Expo Logistics moves national and international clients’ innovations and products of all kinds of businesses. Our customers appreciate us for our reliability and our solution oriented approach to all transport problems; regardless of the freight volume, the complexity of the shipment or the distance to the trade fair or congress area. We develop long-term cooperation out of a business relationship, through our service and the trust our clients put in us. Once again, our service convinced the jury of the prestigious IELA (International Exhibition Logistics Association) in the category Best Export Agent International in 2016. We would like to express our gratitude for receiving this award! We offer a global logistics network as well as tailor-made logistics solutions for your trade fair appearance. We build an individual transportation concept considering all available carriers. Whether by land, air or sea: Your exhibits will get to your presentation safely and and on time. Fair logistics from a single source- Come and see our services for yourself!